California is beautiful. This was my first time in the Central Valley and I’m glad to have been able to road trip it there. Experiencing the change in geography, weather, and mood slowly unfurl from the Bay Area to the San Joaquin Valley through the lens of the car window will be the fuel for many more poems to come. The conversation on the way down between Barb, Craig, Javier, and I will be the fuel for more broader discussions on American Poetics, believe that. No, more of a celebration. A wake, as in to remind the living of what they have. You could feel the energy right away as old friends and new friends found each other over good drinks and food. The energy at the raffle table was amazing as some amazing literary gems were on display and every time you looked over, more was being added. Daniel and Sasha were amazing hosts keeping the energy live and the poetry flowing from reader to reader. Props to James Espinoza for handling the raffling of prizes with wit and joy. Too many highlights to name but the Puentistas of Fresno City College starting out with a group reading of “fresno nights” really set the table for how far reaching a poetic work can be; how it can span generations, place, and even death. As a writer I know these things and I strive for them but to see it in practice made me step back and think if I am doing enough and what more can I do to get to that place and how the ice worker can help me get there. I mention the ice worker because I’ve never met Andrés Montoya and do not want to front as if I ever have. But I do know the ice worker, the speaker in so many of Andrés poems that is so angry he punches at every thing he loves, a witness to so much destruction, and a prophet to the new Aztlán he imagines for his people. The ice worker has been a steady teacher and voice in my head since I have taken on the project of bringing my City, its destruction, and rebirth into poetry form. Sometimes, I get it right. And, far too often, I am off the mark; but the mark is still there and the ice worker has shown me it can be done. Hearing the stories of Andrés Montoya from those who knew him and shared his life brought smiles and sadness in me. While the world lost a valuable voice and teacher, his family (in all its forms) lost a true brother. The sense of loss is immense and irreconcilable, but the sense of compassion and gratitude was nearly as large. The Montoya family shared all they had with the room and the readers and it was a pleasure to give some back. Great to hear the poems of friends, poets who I know from their work, poetic elders, artists, students, and the Montoya family. This was true community in action and about as perfect as it can get. The only downer was the fact that Rigoberto González was grounded in New York through no fault of his own. Malaquias Montoya ended the night by introducing a piece of his art that was up for auction. The portrait, Don Alberto, was of former Attorney General Alberto Gonzales, which put Malaquias in between honoring a member of La Raza and citing the Gonzales’ part in the current administration’s abuse of Raza. The solution? The inclusion of this quote in the portrait. No olvides nunca que los menos fascistas de entre los fascistas también son fascistas. I’ve been reading my copy of In the Grove and can say it is one of the best journals I’ve ever read. It is an honor to be included with so many colleagues, friends, mentors, and Andrés Montoya himself. Congrats and thanks to Lee Herrick, Daniel Chacón, and all the staff at In the Grove for all their effort in this amazing issue. 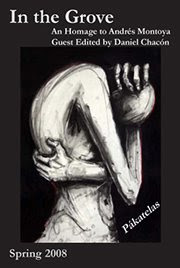 Please check out In the Grove for a list of contributors, sample poems, and ordering information. Praise God, Andrés would say. Praise God. Great scene-setting. I often feel jaded about poetry readings, but how wonderful when you come into one with a roomful of spirit. On California/Central Valley: I forget if Fresno is north or south of Harris Ranch, but, if you did pass it, wasn’t it freakish to a sea of cows, neverending cows (and pungent, of course) from highway to horizon. You know you’ve really migrated into the belly of the other coast, when you get a sight of that. P.S. Hearing the evening news report that Alberto Gonzales cannot get a job even after putting feelers out at law firms all over the place filled me with endless glee last night. The man is UNEMPLOYABLE. Thanks for the feedback, Debbie. And, oh yeah, the spirit was definitely around for this reading. This is a great recap and take from your view, Oscar. May I copy and/or use a few of the pictures for my for own use and for my Letras Latinas blogpost? Feel free to use anything you need. It’s my pleasure. It was a pleasure meeting you, Oscar. The vibe was great that night, and I think I’m still feeling the residual effects of the poesia. Great meeting you and hearing you on the mic, Manuel. I am loving your contribution to In the Grove. The poesia of Andrés, Roque, and all the readers will stay with me for a long time. Just finished posting Lee’s words and the photos he passed along. Glad that Letras Latinas could share in this moment, however indirectly. Thanks for helping spread the word, Francisco. This event was a true example of poetry and community. And if there is a video, you better believe I want a copy of the DVD! There was someone recording it for Arte Américas’ archives, and they told me I could get a copy. I’ll try to track it down in the next couple of weeks.